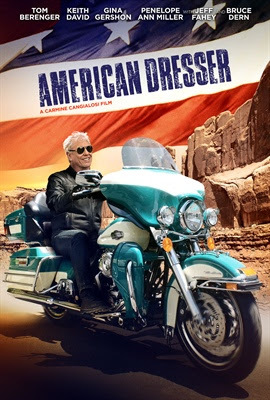 Carmine Cangialosi didn't set out to make a motorcycle film when he began writing the script for American Dresser. The actor-turned-screenwriter/director and lifelong motorcyclist said he set out to make a, "modern western," and chose to incorporate his familiarity with the motorcycling lifestyle into the project. "You can't write a western movie about the horses," he said. The film's story line focuses on lead actor Tom Berenger's character, John Moore, as he embarks on a cross-country motorcycle trip to cope with the recent death of his wife, as well as confront a decades-old family secret. Cangialosi hopes his first film project featuring motorcycles will resonate with riders and non-riders, alike. His father is a veteran and a motorcycle rider, much like the main character in the film. While he rode dirt bikes in his youth, the younger Cangialosi's acting schedule did not allow him to have much time to ride. He chose to diversify his film career by branching into writing and directing. After his first film project was released in 2002, Cangialosi began writing the script for American Dresser. It was his first time featuring motorcycles in a film. He used motorcycles to attract motorcycling's "built-in audience." He said motorcycles spearhead a multi-billion dollar industry, and he hopes using them in the film will help make it more attractive to audiences. "Motorcycles are very iconic," Cangialosi said. "People either ride or want to ride." While he has a lot of respect for other motorcycle-themed moviesAmerican Dresser, Cangialosi said he drew more influence from western films like Dances with Wolves, The Unforgiven and There Will Be Blood. He was also grateful for the major contributions that actors Berenger and Keith David made to the film. "I was beyond fortunate to get them onboard this project." Cangialosi said. One of the challenges he faced was teaching the film's two main stars how to ride. "Tom [Berenger]'s wife rides, and Tom rode dirt bikes as a kid," Cangialosi said. He said David did not have previous riding experience. David's busy schedule forced Cangialosi to give David a crash course on how to ride a motorcycle shortly before filming began. The Harley-Davidson motorcycle ridden in the film by Berenger's character is owned by Cangialosi's father. Cangialosi also wanted to get an Indian motorcycle into the film, so that is what David's character, Charlie Wylde, rides. "I did not want to make a brand movie," he said. "I wanted to make the film as timeless as possible." Cangialosi said he doesn't have plans to make another film featuring motorcycles, but would not rule out using them again. "Making this film was the hardest thing I have ever done," he said. "Whatever I do next, I will let [the project] come together organically …. Like a comedian, I don't want to become too topical." American Dresser was released on video on demand Sept. 21 and received a limited theatrical release Sept. 23. More information about the film can be found on its website at www.americandresser.com.